Penfield Reef is a mile long submerged rocky area located approximately one mile offshore of Fairfield and Bridgeport, Connecticut. Ships traversing the vicinity during the mid-1800’s would regularly hit the rocks. In 1868 a lighthouse inspector called Penfield Reef ‘one of the great dangers to the navigation of Long Island Sound’. 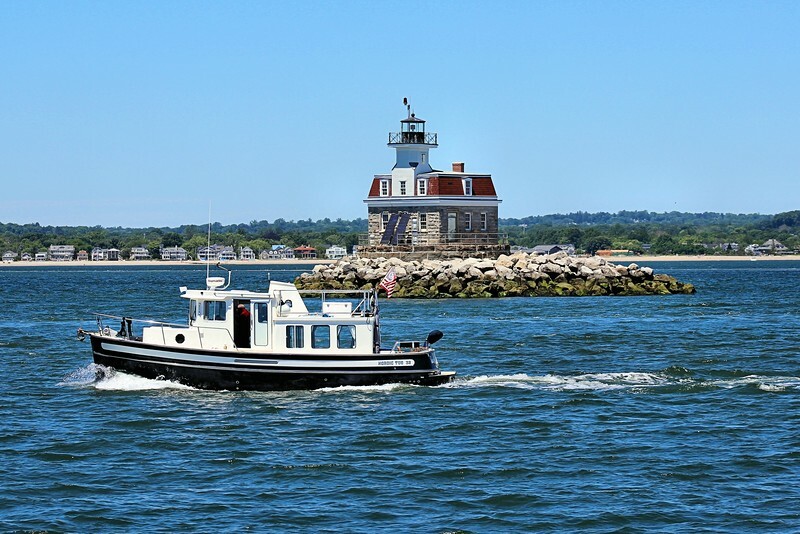 As Bridgeport’s industries grew and shipping increased in the area, the clamor to build a lighthouse also increased. In 1870 Congress appropriated $55,000 towards the project to build a lighthouse on Penfield Reef. A granite riprap foundation and an 18 foot tall pier, designed by architect F. Hopkinson Smith who had also designed the Race Rock Lighthouse, were laid in 1871. A 28 foot square 2 story keeper’s residence with a lantern protruding from the center of a mansard roof was constructed atop the pier in 1873.